Where has the year gone – Christmas is almost upon us, with the New Year celebrations to follow shortly thereafter. As this edition of AR is being prepared, we have seen the running of “the race that stops a nation” and the hamfest season is back in full swing before its end of year pause. I trust that you all managed to cross a few tasks off the “to do” list. Personally, several big items have not been tackled. However, I have managed to complete several tasks. Of course, several other new items have been added. As most will have gathered from my last missive, I have become bitten by the SOTA bug. That has also stimulated lots of thoughts and experimentation with antennas for human-carried portable gear, as opposed to operations based close to a vehicle. The latest effort is a lightweight Yagi for 2 m, based on a design by DK7ZB. The result, which I may write up down the track once its performance has been checked, is a seven metre mast for holding the centre of an inverted V HF dipole, or a 6 element Yagi for 2 m with a four metre mast, with a total mass of about 1.3 kg. Not bad when you consider that the core – a seven metre “squid pole” – comes in at one kilogram by itself. Add to that the mass of the HF antenna and feedline/s, plus the radio and at least one battery, and it starts to add up. If the Yagi works as expected, then it should all make a reasonable, flexible SOTA station which is not too taxing to carry up the hill. The 2013 Callbook has been available for a couple of weeks and is hopefully selling well. As I have previously indicated, Greg VK3VT is unable to continue the task for next year and we are seeking a new Editor for the Callbook. Thanks to those that have already expressed interest. Anyone else interested needs to “put up their hand” very quickly to be in consideration. Regardless of one’s personal beliefs, the end of year is a season of celebration. One cannot escape the advertising promoting gift, food and drink purchases. Most celebrate the coming of the New Year, some more enthusiastically and “harder” than others. Some hope that “Santa” brings a nice gift for the shack. Perhaps the key is to ensure that you enjoy the season and make contact with family and friends. It might also be an opportune time to revise that “to do” list and make more definite plans to ensure that more of the items are completed in the coming months! I trust that you all have a safe festive season and a prosperous New Year. Summer is traditionally the season for VHF, UHF and microwave operations, with increased likelihood of enhanced propagation. Some prepare for the season by getting out for a fun day of checking the gear before the contest season commences. 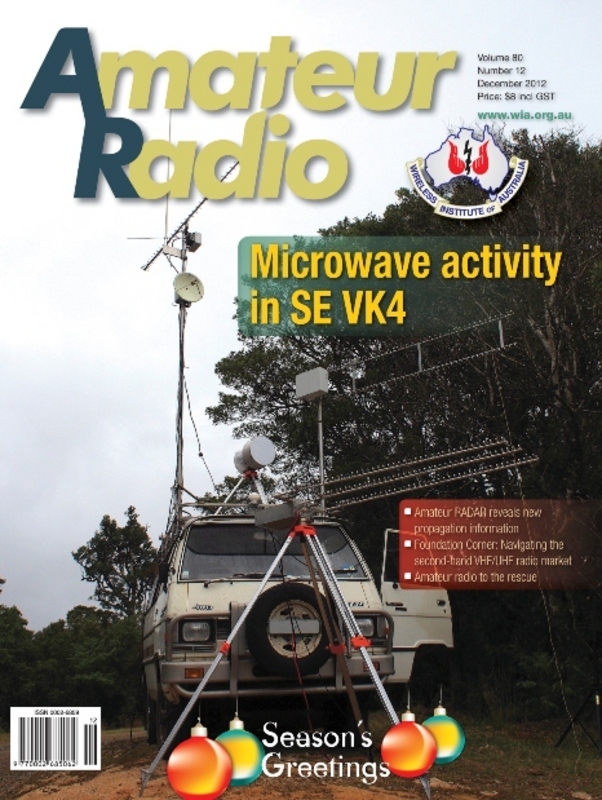 Our cover shows the set-up at VK4OE/2 during the recent Microwave Activity Day in SE Queensland. Antennas for all microwave bands from 1.2 to 24 GHz are visible. Photo by Doug Friend VK4OE. I can’t say that this time has been a particularly joyful one for us at the WIA following the recent passing of our past-President, Michael Owen VK3KI (SK), although with a lot of dedication from WIA Manager Mal Brooks, our office staff Margaret and Dianne, and our team of overworked volunteers, I can say that the WIA is in fine shape. For instance, in the last month we have participated in two very major international activities. Dale Hughes VK1DSH attended an ITU working group in Geneva. Dale is the Chair of that working group which is investigating the possibility of a new amateur service allocation between 5250 & 5450 kHz. The ITU is also addressing issues associated with short-range vehicle radar in the 78 GHz band, and a telegraphic alphabet for data communication by phase shift keying at 31 baud in the amateur and amateur-satellite services. As Chair, Dale’s tasks include the drafting of several documents which will cover the characteristics of typical amateur operations and their compatibility with existing services within the proposed band. These ‘sharing studies’ are a very important aspect of the process as they will largely determine whether or not a 5 MHz amateur allocation is possible. Dale’s work is long and arduous, as everyone has to have their say and there is strong opposition from some prominent administrations to any new amateur allocations, largely depending on the politics and ideologies of various countries. Dale also keeps his ears to the ground for any other emerging issues which may affect amateur radio. Also last month, Geoff Atkinson VK3TL and Peter Young VK3MV represented the WIA at the IARU Region 3 meeting in Vietnam. The WIA seeks an improved funding model for Region 3 in order to ensure the Amateur Service continues to be adequately represented internationally on spectrum allocation issues, and is capable of protecting its primary spectrum allocations through an effective global intruder monitoring system. Other IARU Region 3 issues of interest to the WIA are the development of better bi-lateral arrangements for amateur emergency communications and disaster recovery, and encouragement of amateur qualification training activities in developing countries. Although this long-term international work is vitally important for amateur radio, and quite expensive, it often goes largely unnoticed. As a WIA member your money is going to these vital activities in support of amateur radio, and unfortunately you are in effect subsidising others who choose not to be WIA members. Such is the nature of the beast. Closer to home, our activities are more tangible. I must say that this magazine is looking good, our training and assessment activities are continuing with excellent results, and our relationship with the regulator is strong. Although membership continues to rise slowly, for the first time in many years the WIA may show a small financial loss. Nothing serious, but a trend that must be addressed. The reasons are probably many and varied, but an ageing membership, the general economic conditions encouraging people to save rather than spend, and a fall in the number of new Foundation licensee’s entering the hobby are all contributing factors. It would be easy to simply raise membership and service fees, but given the profile of our membership and the tenuous state of the economy, that would probably be counter-productive at this time. We could reduce expenses by cutting activity and member services, but that’s never a good plan for the health of any organisation. The WIA Board has made a decision to introduce a new ‘cloud’ based membership management system called MEMNET. A cloud system is one where the information system is developed, provided, upgraded and maintained by an independent software company, thus relieving the WIA and its volunteers of that responsibility. The MEMNET system will allow on-line membership access to all WIA services and facilities, and will also provide a targeted information service to members depending on their interests and activities. For instance if you are a contester, MEMNET can automatically send you emails about the latest contest and propagation conditions, or you might like to get news items about new wireless technologies. The MEMNET system will allow you to view and edit your personal details on-line, pay your membership account and enter your particular areas of interest. The MEMNET system is expected to achieve administrative efficiencies which effectively pay for the system in the first year of operation and then provide a significant saving in years to come. Naturally a telephone service will also be available for people who prefer it that way, but the MEMNET system will be quicker and more efficient. So, you can see there are a lot of things happening at the WIA. It’s promising to be an exciting and busy year and our next issue of AR will have more details on our international work and the MEMNET system. From all of us at the WIA, have a very merry Christmas and lots of DX. I would particularly like to thank all those people whose support and just plain hard work has ensured a very smooth transition over the past few difficult months. The author had decided to move from VK5 to VK3, and as a result a number of trips, in convoy with friends, had been arranged, with one new trailer and another of dubious aging characteristics placed into action to transport what had to be transported across state borders. 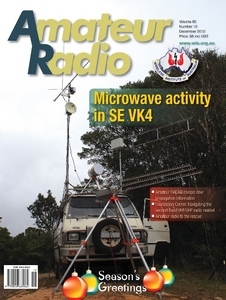 This is the story of the trials and tribulations encountered as a result of the older trailer not really being mechanically sound enough for the task at hand – and the magnificent support offered by the amateur radio fraternity to ensure the problems were resolved, and the task completed successfully, without any personal injury. Big things are coming to the Fraser Coast, with Maryborough set to host the 2012 Australian Scout Jamboree – one of the largest events ever to be held in the Maryborough area. The article provides some basic background and information on this event, and several references for those who wish to know more. Our cover photo this month shows the portable station set up by Doug Friend VK4OE for the recent Brisbane VHF Group Microwave Activity Day. Doug’s report of the developments in the microwave bands in SE Queensland also includes an account of the preceding microwave tune up day. This article in not your average read. It is quite complex, and possibly is only for those amateurs with some technical interest, knowledge and skills in the subject under discussion. It is a paper that covers the application of highly developed software to assist in understanding the capability of chirp radar. During this process some basic operating techniques have been developed to easily verify each measurement to be certain about what is being measured. Further, the author outlines some unexpected results found with respect to propagation on the six metre band. A very well produced, interesting and thought provoking paper and no doubt excellent reading to those so inclined.